In the last few weeks I decided to swim in some British lakes. Well, it wasn't really a premeditated decision but I ended up doing so. During a very good and special week, I was down in England in the Lake District. The Lake District corresponds very much to what we, foreigners, imagine the English countryside to be like. Lots of lawns, green hills, cows everywhere, friendly people... And a nice strong rain every now and then. There I swam in the largest natural lake in England, the Lake Windermere. 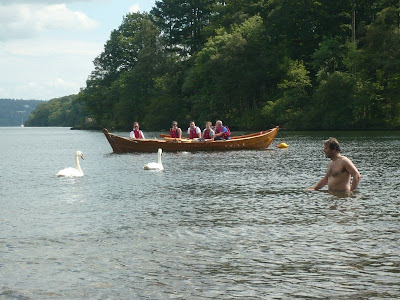 The weather was great and really inviting us in, as can be seen in the picture of me facing the dangerous swans. Don't worry, dear reader (the one that comes here once a month), my health will not deteriorate to the point of stop writing here. Major problem for this blog was that my wee camera was in my pocket. I still didn't turn it on as I'm waiting for it to be completely dry (five days in rice). It would be a shame if I had no way to photograph my British adventures for the blog. Let's hope the rice trick works! If it does, I'll have amazing photos of my climb to Ben Lomond to show here. What is the monster of Loch Ness doing in the Loch Lomond?